Fat Bruce Lee and I managed to break away from prepping Santa's sleigh for the upcoming holiday. It's not very well known, but Santa and the elves truly do little of the heavy lifting. The real grunt work is done by a cadre of dedicated volunteers who work tirelessly behind the scenes to make everything goes off without a hitch. That is the true meaning of Christmas. Damon and Pythias had been getting mixed but better than average reviews, and it was up to us to set the record straight. We had the Air Force swing by to pick us up, and we performed a HALO jump to the Westwood location. 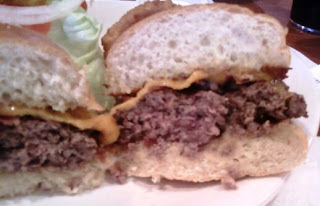 The Beef: This was 1/2 pound of medium grind, loosely packed, Angus Chuck, which had been over-manipulated prior to being formed into patties. 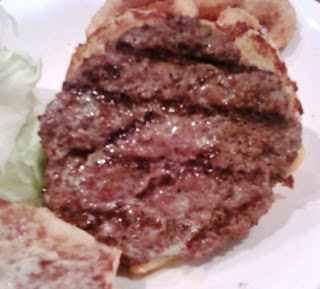 The beef was either over-manipulated or it was an especially tough piece of Chuck, because the burger was a little chewy. It had little funk to it, and it was only moderately flavorful. I was a little oilier than I would have liked, and it leaned toward dryness with no liquid coming off of the burger...even when squeezed. The Seasoning: There was almost no seasoning at all on the patty. The Preparation: The burgers were over-cooked to Well Done. This was in spite of our request for Medium. Damon and Pythias used a gas grill to prepare their burgers. The deep indentations in the patty suggest that the burger was pressed while cooking, and this further robbed it of any juiciness. The Cheese: They used a thin slice of Cheddar, which was too rubbery to melt or provide any creaminess in the mouth feel department. The Cheddar was flavorful, but it had been pre-sliced and sitting out too long, so it had oxidized to the point of belonging in the trash rather than on a burger. The Bun: The bun was a kosher, sweet, fluffy burger bun. The bun was moist enough to compensate for the dryness of the beef, and it stood up well to the rubbery texture of the over-cooked patty. 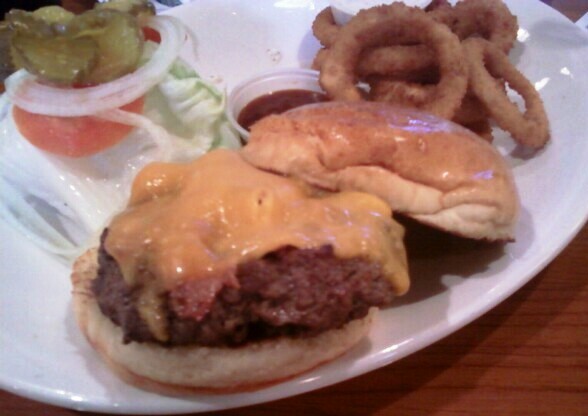 The bun really held this cheeseburger together in terms of texture. This was Fat Bruce Lee's favorite bun of all time. The Meat to Bun Ratio: This was fine. While it was a touch heavy on the bun, the bun was sweet, chewy, and moist enough to be enjoyable on its own. The Fries and Rings: Meh--the spiral cut fries were not cooked long or hot enough, so they were not crisp or brown, and they were not seasoned. The rings...it was like they ordered the rings from another restaurant. The rings were perfect--crisp, brown, and flavorful. I would order those rings again and again. 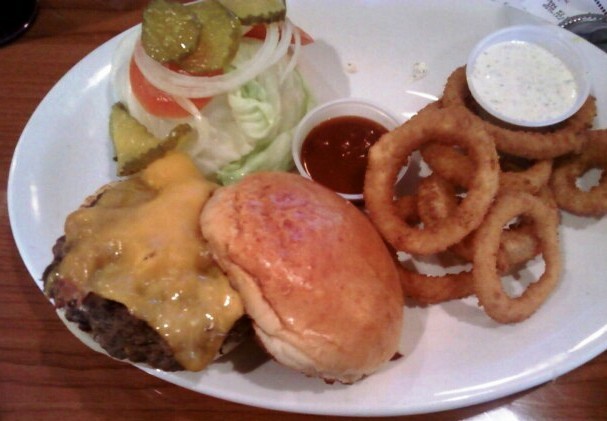 The Value: $10 for a 1/2 pound burger, a side, and a drink. The value was strong with this one. The cheeseburgers at Damon and Pythias automatically came with crisp, thin, crumbled bacon on top. We did sample the burger in this way, in addition to our usual austere methodology, and that bacon mostly compensated for the lack of sear, seasoning, and general neutralness of the beef. Bacon makes most things better--not frozen yogurt, though--and it certainly make the Damon and Pythias burger better. Burger Review : The burger at Damon and Pythias was flawed in terms of preparation, but it was still filling and pretty darn good--I finished mine. Have it with the bacon, though. The bacon was essential to the flavor and texture profiles of this burger.